The “upcycled” doors of Cleveland’s St. Clair. We keep hearing buzz about places like Cleveland, Omaha and Houston, where cool arts projects are redefining perceptions of what the cities are and can be. 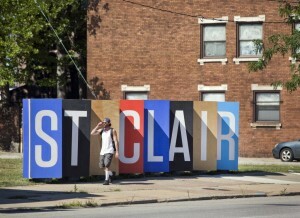 Cleveland’s St. Clair Avenue actively engages in neighborhood-wide “upcycling,” creating funky arts and crafts from discarded materials while generating business from the products. Green in the City, an Omaha-based design competition, will create a multipurpose community space and outdoor theater in that city. And Houston’s “rockabilly oasis” of Mid-Main boasts a First Thursday that not only attracts people to the neighborhood for an evening of music, art and libations, but also donates 5% of the evening’s proceeds to local nonprofits. These cities are affordable, compared to New York, Chicago or San Francisco, and they’re places where more and more people are moving to balance work, life and play. Access to arts and culture and green space, diversity and general livability are huge factors contributing to these decisions. At the same time, it takes creativity and an enormous love of community to help make these desirable urban traits a reality. A recent series by The Atlantic Cities has been profiling these and more cities as “where millennials can make it now.” We’re excited to see what’s covered next! This entry was posted in Beyond Levitt, Placemaking and tagged art, Cleveland, creative placemaking, green space, Houston, Mid-Main, millennials, Omaha, The Atlantic Cities, upcycling on November 12, 2013 by Melissa Smith.